I am not widely regarded as a "mom-blogger" in our circle, I am always categorized as a styleblogger so I don't often get invited to kiddie events (much to mine and Nikola's disappointment). The few times I do, I make it a point to go even if it's way, way out in the boondocks. When I got the Toys R' Us invite, I was so excited (you'd think it was ZARA :P), Nikola was too. She asked me if she could skip soccer practice to accompany me. Being that this was a rare occasion, I obliged and we transformed the trek into a fun day trip. Robinsons Place Antipolo is a bit far from where I live but it doesn't take very long to get there via Marcos Highway and the route turns scenic once you're halfway through Sumulong Highway which is where its located. This new mall, is pretty and spacious with a big outdoor parking lot surrounded by trees. It really makes you feel like your "out of town" even if you're just a few minutes away from the city. The mall is divided into several two-storey buildings with outdoor verandas. Toys R' Us can be found in one of these adjacent structures separate from the main shopping center. Although a bit smaller than the other Toys R' Us branches I've visited, it's still complete with all your favorite brands in stock (as well as those hard to find toys that ALWAYS immediately run out in malls closer to home). And of course, no self-respecting toy store would be complete without these brands in their line-up: TRANSFORMERS, HOTWHEELS, POWER RANGERS, PLAY-DOH, FISHER PRICE, LEAP FROG, MONOPOLY, LEGO, LITTLE TIKES, PLAY-DOH, PLAYSKOOL, DISNEY, MARVEL, SONY PLAYSTATION, BARBIE, X-BOX, DISNEY INFINITY and a lot more! I have always wanted to learn how to knit and my recent obsession (and success :P)with the Rainbow Loom has boosted my confidence ten-fold. I think I'm ready to conquer the yarn. Nikola is still in her Rainbow Loom stage and was pretty much pre-occupied the entire time making bracelets at the special Rainbow Loom booth that was set up for us during the event. If you live in the Antipolo area, Robinsons Place is a nice new venue to take the family out for lunch and shopping. If you're far away like me, it's still a nice place to go when you feel like escaping from the city for a few hours. 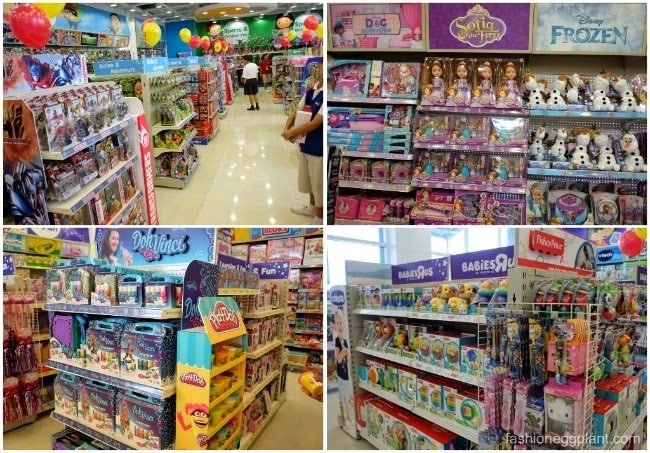 for more info, visit: www.toysrus.com.ph or connect with Toys R' Us Philippines socially on Facebook and Twitter (@toysRusPH) for first dibs on promos and fun events like this!